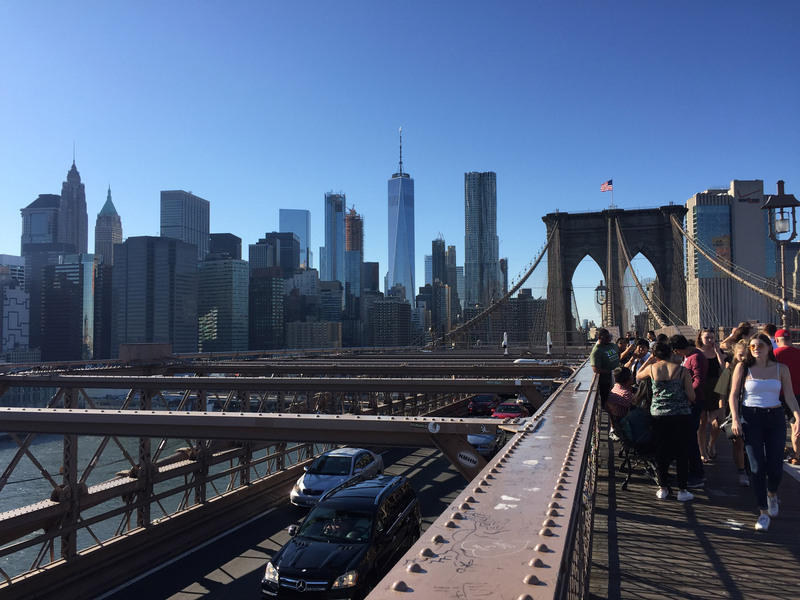 The lede is a killer indeed, and some readers are no doubt murderously angry at the prospect of losing the stunning views of Manhattan from the iconic Bridge. See the Post’s article for a rendering and more details. Does anyone know if there’s been research into building a tunnel UNDER the BQE/promenade area highway instead of overhead since it seems anything above ground isn’t working? How much money does tourism pour into NYC coffers, and how would this affect those figures? Not only would the view be obscured, but the process of building these structures would take a very long time—and during construction, the pedestrian walkway on the bridge would have to be closed for months at the very least. I’d wager that the adverse affect on NYC tourism could run into the hundreds of millions. Somehow i doubt people will stop coming to NYC because of the BQE rehabilitation. The rendering of the overpass obscuring the view was created by A Better Way. I’m sure they’d be happy for it to be the lead image for this post. I looked on the organization’s website for media-use photos, but I didn’t see any. Yes, the DOT did fairly extensive study which weighed the feasibility of several tunnel alternatives. It found any route under the Promenade or in its vicinity is unfeasible due to numerous subterranean obstructions. However, one route was deemed feasible; a tunnel from Williamsburg to Sunset Park that would bypass the entire area. Such a tunnel would do away with much of the traffic traveling on the current route, which would only be necessary for approaches to the bridges. The size of the roadway could be reduced to 2 lanes each way. Furthermore, the section through Cobble Hill and the Heights could potentially be eliminated if the bridge traffic were simply routed directly towards the tunnel. It would not only provide relief from the nightmare rebuild scenarios but also relief from the current traffic levels forever. A shame that the NY Post, in an otherwise fine article, keeps emphasizing the celebrity resident angle in its coverage. This “innovative” proposal increasingly reminds me of Robert Moses’s failed plan to build the cross-Manhattan Expressway (the one that was supposed to stretch across Greenwich Village and Soho). But how many people come to BH specifically to walk across the Brooklyn Bridge, or visit DUMBO and eat at Grimaldi’s? how many come to BH specifically to ….. visit the Promenade??? Quite a few by my reckoning. WOW! This solutions seems to solve many of the issues and is reasonable and doable. I wonder why it is not being explored more. Thank you for sharing. I’ve wondered why this angle has been pursued. We currently route tons of commercial traffic to Brooklyn Hts – when it can’t go over the Brooklyn Bridge. It seems like it makes so much sense to divert it before it ever gets here. Why did DOT reject the W-SP tunnel? The tunnel is nothing new. The plan was started over a decade ago by the state DOT who at the time was going to handle the BQE rebuild. They were moving forward with the project until “Governor” Cuobino vetoed it and dumped it all on the city. The city then picked up where the sate left off and commissioned the feasibility study. The only thing holding it back is money, it would indeed be more costly than the current city DOT proposals but would also offer more in return. Indeed the tunnel does solve many issues, which is why its so baffling the BHA et al. are silent about it. Here is a plan deemed feasible by the DOT’s own study so they can’t simply dismiss it. The DOT even said at the September meeting, while they weren’t immediately in favor of the tunnel, it wasn’t off the table either. Why isn’t there wide spread support? Probably general ignorance of the alternative and a feeling funding would be futile. So instead the BHA is wasting time on the “Over the Berms” plan, a plan that offers very little improvement from the DOT’s proposals at a significant cost increase. Why they cannot grasp this beats me. There was another tunnel option discussed circa 2006-2007 which would have had the BQE divert around Division St by the Navy Yard into a water’s edge tunnel to just passed Atlantic. Aside from the lack of money the other concern was navigating around the Brooklyn Towers of the Manhattan and Brooklyn Bridges (I guess that tunnelling would cause them to displace?). The massive cost overruns of the Big Dig in Boston were headline news at the time, which seemed to kill any tunneling options here (again, 10+ years ago). The 2016 study found 2 routes feasible. It is possible, what’s needed is public support, if there’s enough the funding will follow.